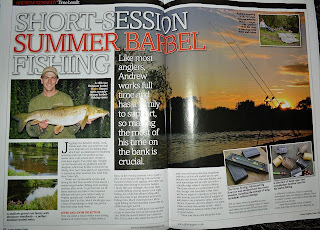 Andrew Kennedy's Angling Blog at Just-Fish.co.uk - Fishing Blog Coarse Fly Lure Pike Perch: Short Session Summer Barbel Article in this months Coarse Angling Today magazine - out now! 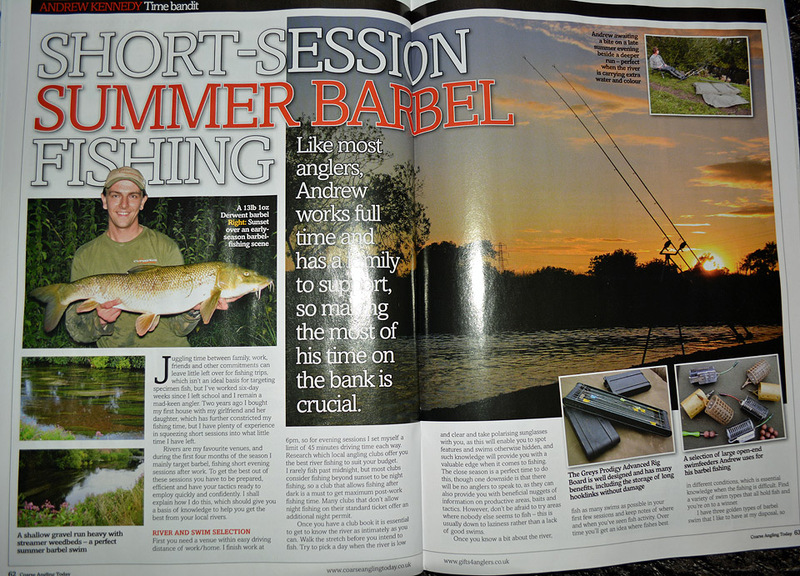 Short Session Summer Barbel Article in this months Coarse Angling Today magazine - out now! It's the first article I've had published in CAT (but hopefully the first of many!) and besides being apt for the conditions right now, it explains most of what a novice or first-time barbel angler needs to consider to have a go at catching summer barbel, after work. If anyone reads it and wants some further info, then I'd be happy to respond via email or on here. This months issue is a rivers special, with an extra 32 pages for the normal price of £2.95, so it's a bit of a bargain! UPDATE - Click here to download and view the article in full, for free, from my website! 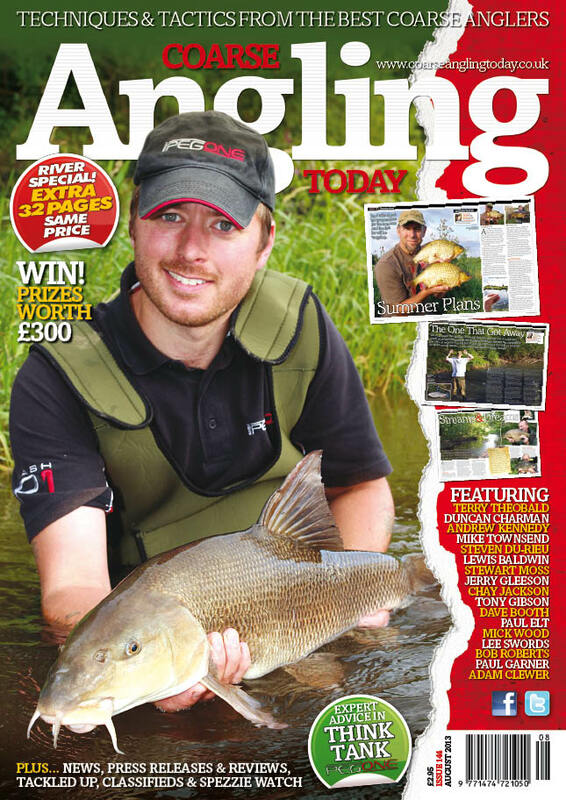 The River Special of Coarse Angling Today is in the shops today! It can also be downloaded via the Apple Newsstand. - Andrew Kennedy – Short Session Summer Barbel Fishing Like most anglers, Andrew works full time and has a family to support, so making the most of his time on the bank is crucial. 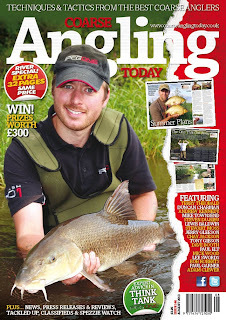 - Bob Roberts – Barbel - Just Fabulous or Simply a Fad? Bob gives us his thoughts on the development of barbel fishing and why he thinks barbel are the new carp. - Dave Booth – Trent Barbel Past and Present Dave relives a memorable campaign on the River Trent. - Jerry Gleeson – Summer Floodwater Barbel Fishing Jerry has some tips for us in case the weather takes a turn for the worse and the rivers begin to rise. - Lee Swords – The Non-Tidal Trent The Trent specialist talks us through an early-season session. - Lewis Baldwin - A Tale of Two Rivers Lewis picks up his diary piece by recalling sessions on the River Wye and Dove. - Mick Wood – A Yorkshire Barbel Scene Mick offers his opinion on the state of modern-day barbel fishing in Yorkshire. - Mike Townsend – Hit for Six Mike raises the question: could the River Trent soon be challenging the more established southern rivers as a specimen chub venue. - Paul Elt – Summer Plans Paul talks about his preparations for the summer and the fish he will be targeting. - Paul Garner – Fishing Photography Part 3: Let There be Light Paul presents the third part of his six-part series. - Steven Du-Rieu – Steams and Dreams Streams are pretty unusual places really, says Steven. - Stewart Moss – The One that Got Away Stewart has compiled a few tales of sessions that will live long in the memory of the anglers involved, for all the wrong reasons. - Think Tank: Tony Gibson – Slippery Customers Tony Gibson talks us through the reasons why he was bitten by the eel bug again. Plus, Kevin Clifford Editorial, Hot Seat, Spezzie Watch, Tackled Up, News, Press Releases and Reviews, and Where’s the Catch? and Drennan 7 Series competitions.